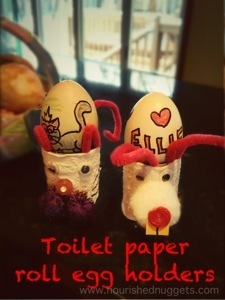 Put them on display on your Easter egg tree or make cute stands for them. 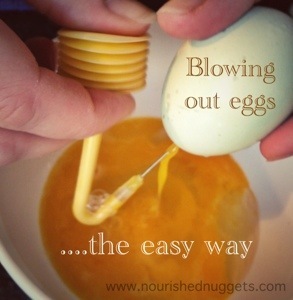 The easy way to blow out Easter eggs for decorating! 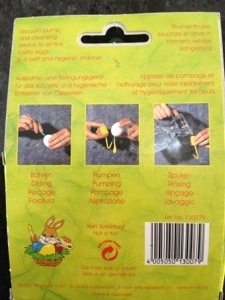 So, I picked up this handy little tool at a Ukrainian Egg decorating store about 5 years ago and we use it every year to blow out the eggs we decorate and hang on our egg-tree. 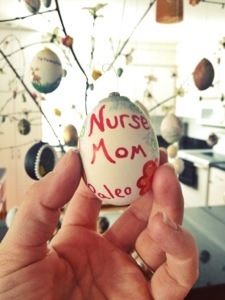 This year our egg-tree is so full that we had to make egg holders for the leftover eggs. 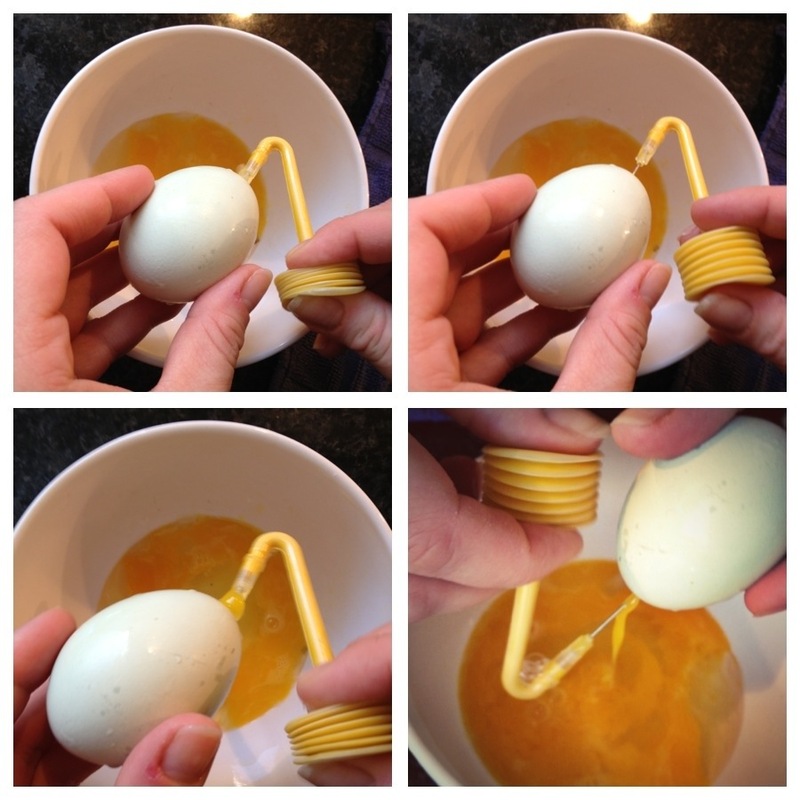 For anyone who has drilled holes in eggs and tried to blow out the contents with your mouth…and then experienced TMJ and ear pain (ouch! ), this is the tool you have to pick up! We might be a tad bit early for starting our seeds this year, but this winter has been waaaaay too long here in Minnesnowta! I need something green and sprouting in my life. Plus, a seed packet costs next to nothing and I just love teaching my little hobbits about planting and growing things. 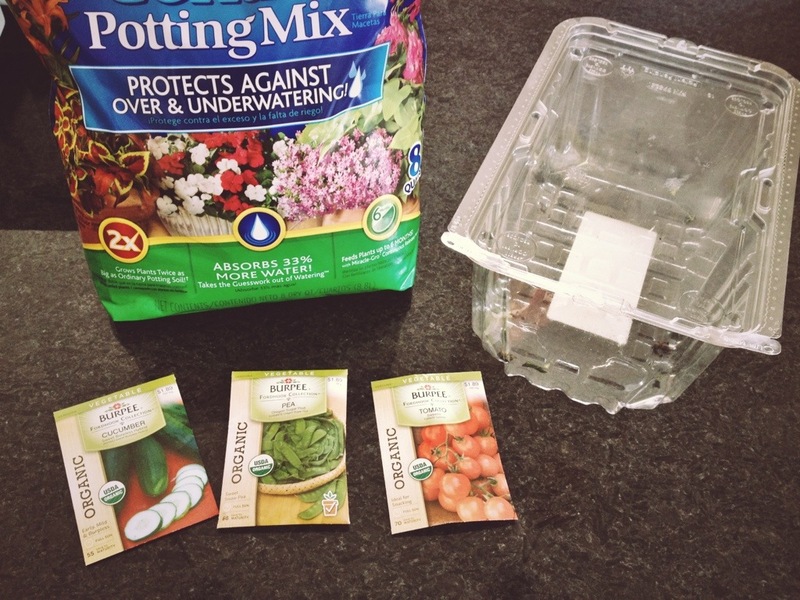 We bought one of those garden starter mini green house things from Home Depot, but it currently resides in our garden shed that has a fairly large snow bank blocking the door…..so today we grow seeds in a salad container. 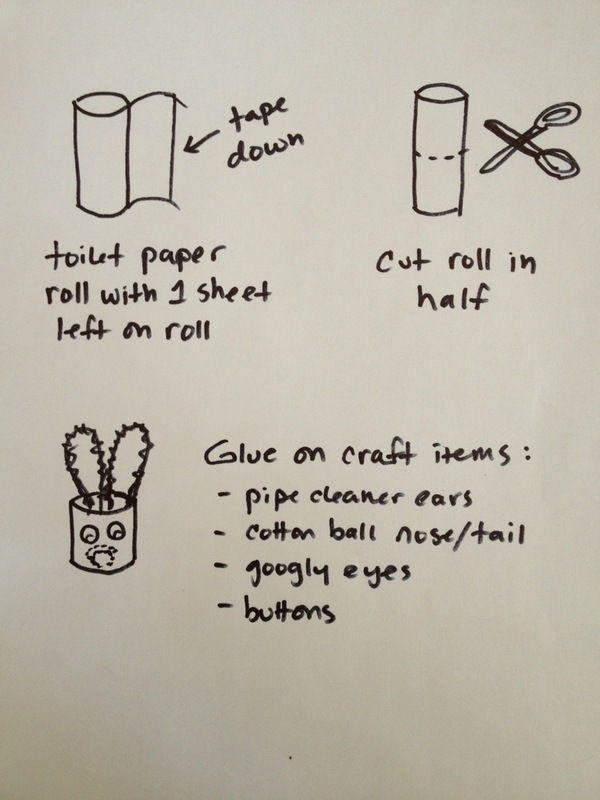 I have to admit that I am feeling pretty psyched about this project idea! Allow your little one to do as much of this project as their skill/developmental level allows, it’s very educational and fun! Pour about 4″ of dirt into the bottom of the salad container. With your finger, draw lines in the dirt about 2″ apart. Your number of rows will depend on the size of your container. We started with 2 rows and plan to add additional containers as our “garden” expands. 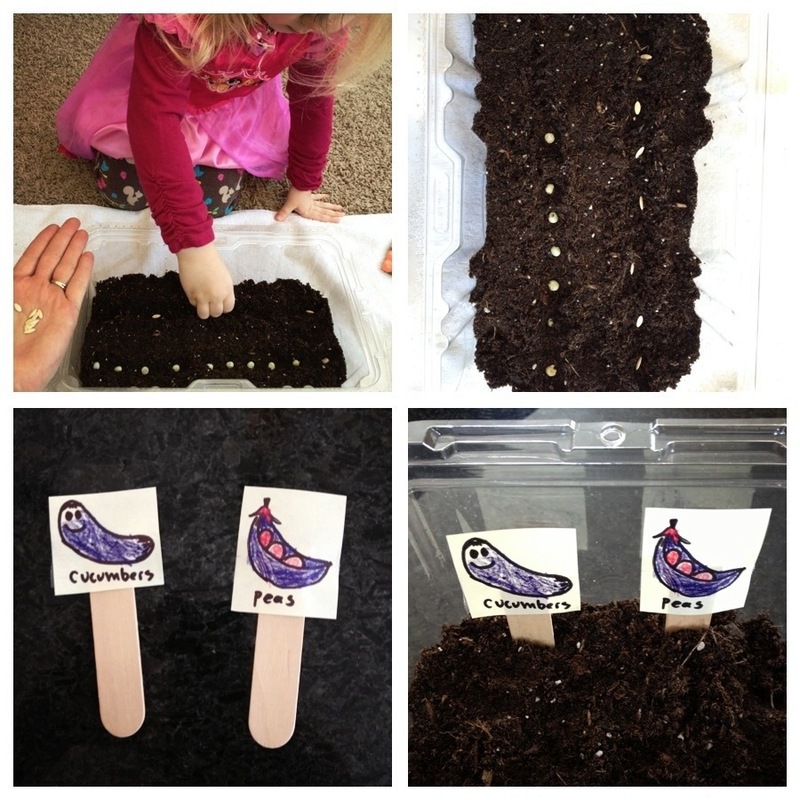 Plant seeds according to your seed packet instructions and cover them with dirt. Mark your rows with popsicle sticks and label them. I let the kids decorate the row markers. Place cover on top of container and water when needed, not too much and not too little. 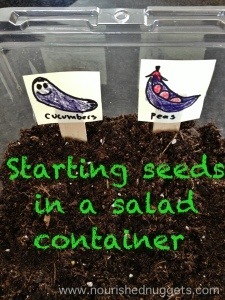 Watch the moisture level in the container, as too much will cause the seeds to mold and rot. Place in a sunny area with the amount of sun indicated on the seed packet. 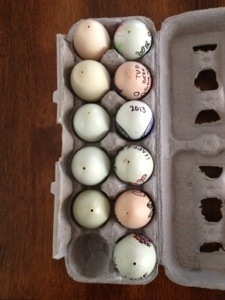 Today we decided that all of the eggs that we have been decorating needed some stands to put them on display. Also, because our Easter egg tree has reached maximum egg capacity and cannot hold even one more egg before it falls over. So, we looked around the house and found a few supplies and this is what we came up with. It is a well known fact that eating these “magical fermented carrot sticks” makes the Easter Bunny come to our house with Easter gifts. Then we leave a few out for him to eat too. The house is decorated for Easter and we have already dyed eggs three times! Teaching the kids about healthy eating is a challenge when the holidays seem to revolve around candy. 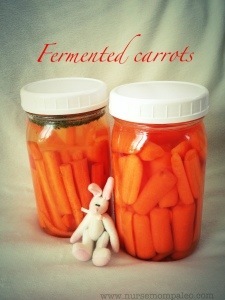 So, we decided to make some fermented carrot sticks for the Easter Bunny because someone has to look after his health. We don’t want him to lose his only two teeth to the devastating effects of candy. 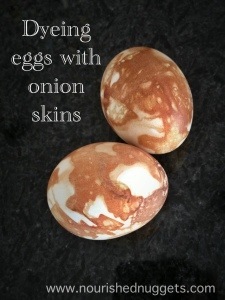 This recipe is easy and fun to do because anything that requires a fermentation period feels a bit like a science project, and I love food science! We usually make our fermented foods with sea salt but today we are using Caldwell’s Cultured Vegetable Starter. We followed this recipe, and tweaked it a bit. I am IN LOVE with coconut butter. It was my crutch when I was dying for sweets during the “21 Day Sugar Detox” (see sidebar for more information). Well, recently I stumbled upon a new product and I think I am in LOVE! Nikki’s Coconut Butter comes in a variety of flavors and I don’t even know where to begin. Just read the labels and you will see that this company has created something amazing! Vanilla.Cake.Batter….’nuff said! I am not a fan of fluoride and even the dentist doesn’t recommend brushing baby’s teeth with fluoridated toothpaste when they are very little. We don’t use fluoride at all in our house and we even make our own toothpaste. My 18 month old swallows everything so we decided that he needs his own toothpaste that is completely safe if swallowed, and yet effective against bacteria in his mouth. 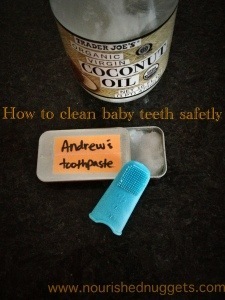 Coconut oil prevents tooth decay and is totally safe for baby. Tada, Andrew’s new “toothpaste” was born. We upcycled an old gum container to store his toothpaste in so it would fit nicely in our medicine cabinet. HERE is the brush we use.